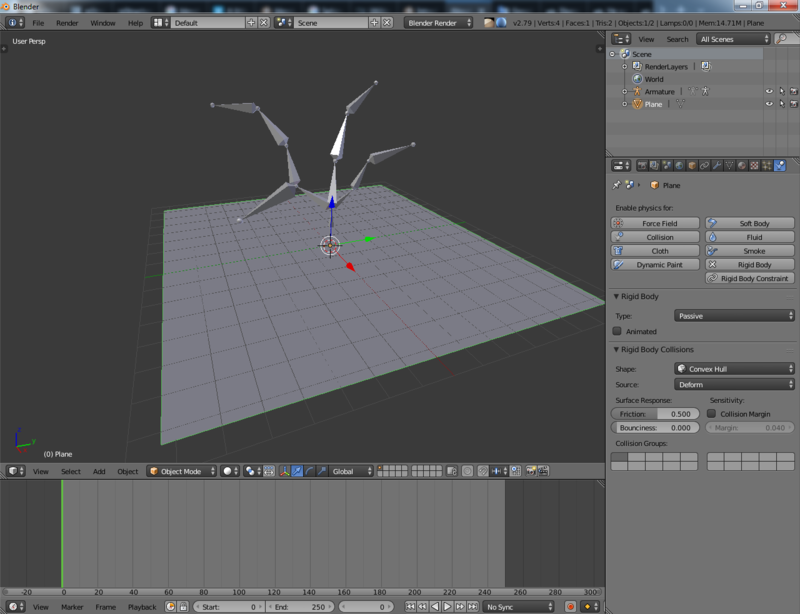 Setup scene like this and select armature. Press Spacebar ,find Ragdoll tools pie menu and press Enter. From pie menu choose Generate hitboxes.Press F6 to play with settings. Select generated hitboxes (select one of them and Shift-G -> Group -> hit_box_group ). 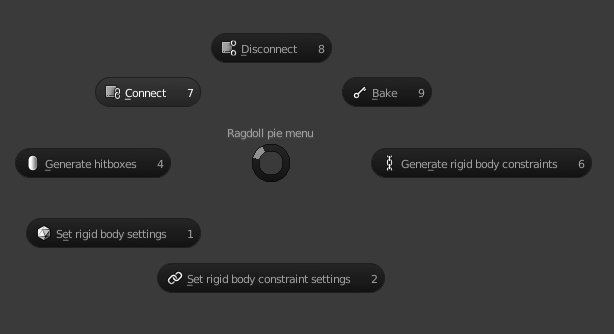 Start pie menu again and choose Generate rigid body constraints . Start pie menu and choose Bake. Start pie menu and choose Disconnect.Then press F6 and check Delete hitboxes. This operator generates hitboxes from mesh object or bones. To generate hitboxes from mesh you should select exactly one mesh object and at least one armature, then set Generate from to Mesh . 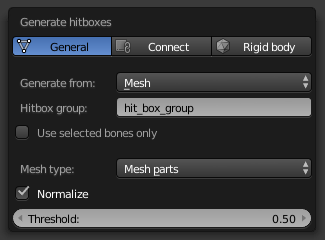 Hitbox shape is based on vertex group,so your mesh should have vertex group with the same names as bones in armatures have,otherwise,nothing happens. If yor model already parented to armature,you have it.And if not ,you can get them py parenting your object to armature with automatic weights,for example. Output hitbox shape can be of several different types. To generate hitboxes from bones you should select at least one armature and set Generate from to Bones .Hitboxes generated this way can have box or capsule shape. If you in Object Mode all visible bones of all selected armatures are involved in generation. If you in Pose mode , only visible bones of active armature are involved. You can change size and shape of the generated hitboxes by pressing F6 after you call operator. By default,after generation hitboxes connects with the correspondent bones. If some bones are already connected , hitboxes will not be generated for them. 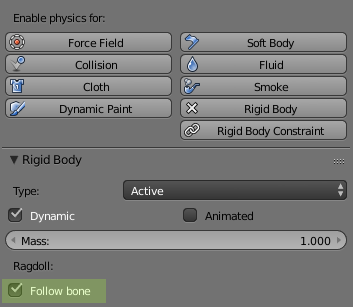 When bone and hitbox are connected in hitbox rigid body settings appears property Follow bone. If it is checked the hit box copies the movement of the bone and if not the bone copies the movement of the hitbox. But here is some limitation.If hitbox of any bone has Follow bone property unchecked,this property should be unchecked for all hitboxes that are connected to children of this bone. If this condition is not satisfied,simulation will be unstable. If some bones or objects are already connected,they are ignored. Do not forget to make objects rigid body and add them to group with other hitboxes. 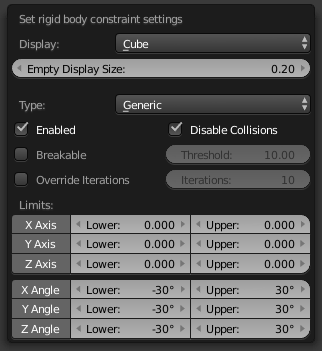 This operator generates rigid body constraints between selected rigid bodies. 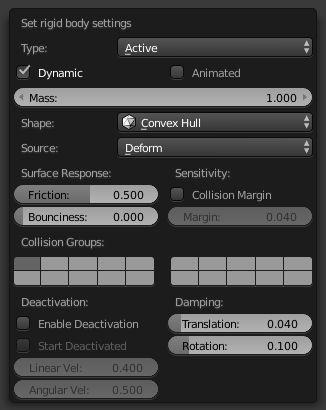 Works similar to Blender's standart Tool Shelf -> Physics -> Connect operator but with extra properties. 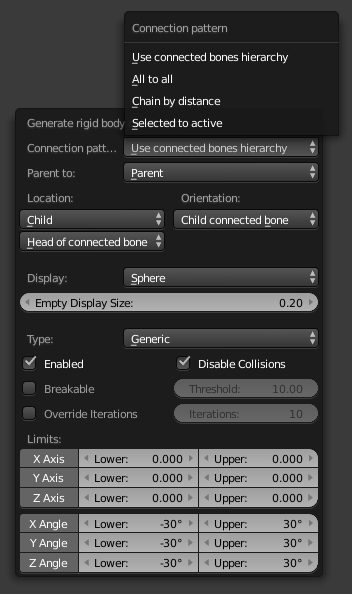 Also has a mode for generating constraints from hierarchy of bones connected to hitboxes. This operator bakes visual transformations into keyframes for connected hitboxes and bones. 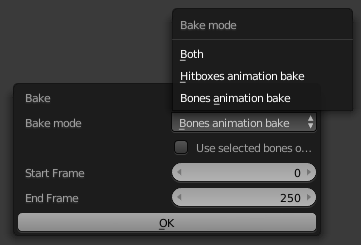 Baking usually takes a long time, depending on the number of items that are baked, and the length of the animation. I've wanted something like this for a long long time! Rag-doll animations produce such a powerful effect, but are so hard to set up and control and tweak after they have been set up. With this addon it becomes possible to experiment and try different options in an iterative way. I would love if the documentation videos had an audio explanation of the principles to not have to reverse-engineer why the steps work. Thanks for this appreciation, Gabriel. I plan to release better documentation videos with next update.